Ever wandered over to Asda on foot through the alleyway opposite Victoria Way? Ever thought your life seems a little duller for it? I can’t help thinking that the Woolwich Road would look completely different if something more pleasing to eye was placed here. This spot used to be an old industrial estate and retail park, playing host to 80s giants such as Queensway furnishings and Harris Carpets. Indeed you can still see the turnings in the roads that used to funnel traffic from Woolwich Road, but these have now been blocked off by fencing. Now it’s just broken tarmac, mounds of earth and scrub-land topped off with a rather dirty looking willow tree. Sightings of rats there are fairly common, and it is also provides a shelter and pedestrian highway for a man selling knocked off DVDs. I’m told this plot of land is worth well over a million pounds and is actually owned by a bank. There’s no way that Greenwich Council will be able to buy this land so the bank is just sitting on it and waiting as its price rises and rises. Every time I walk past this wasteland I think to myself, every second I’m walking past this land someone out there is getting slightly richer. Whilst my life is slowly getting duller. Just behind Sports Direct, the council has granted outline planning permission for redevelopment of the site comprising 4,160 square metres of retail units, 6,715 square metres trade units, 20 residential units (16 x 2-bed, 4 x 1-bed) and associated access and car parking. For more details please visit Greenwich’s planning site. All this seems rather exciting. A rejuvenated business and retail park – but they have done the right thing and lined the north side of Woolwich Road with houses and convenience shops. There are even plans for a piazza. A piazza? 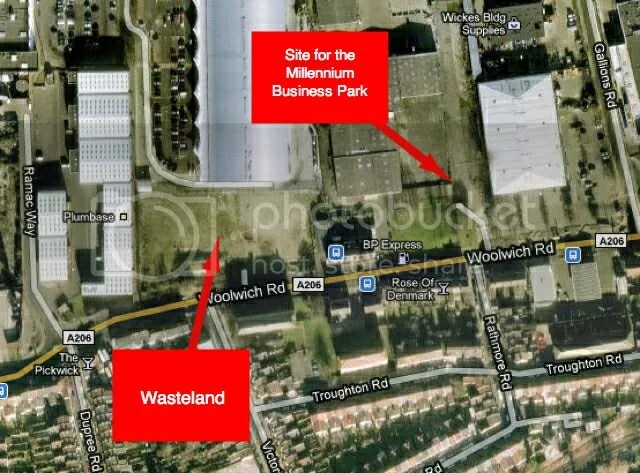 Between the retail park and the houses, perhaps there’ll even be cafes and restaurants. Have you ever imagined eating ‘al fresco’ on the Woolwich Road? No talk of the wasteland I was originally referring to though. As one site is beautifully sculptured into a multi-purpose residential/ commercial complex, another site remains desolate scrubland. So what do we want? Are they sitting on this land in case the up-and-coming O2 and Greenwich Millennium Village floods into New Charlton and we become part of the Las Vegas of London? Is there a more simple purpose that this wasteland could serve? I’ve heard someone say that it should be a children’s playground. A creche for their parents to take them to whilst out shopping. Personally I wouldn’t mind if it was at least just levelled, the fence taken down and we could just have it as grass. Perhaps we should do something. We could urge them into selling up or building something. Perhaps we could even break in there and doll it up with some guerrilla gardening. Who knows, but a walk to Asda will always be dull as long as it’s kept the way it is. Would be great if the retail outlets here are expanded. An M&S for me would be a dream edition. Also something like the little Debenhams that is on Eltham High Street. Somewhere to eat perhaps as well, like the couple of restaurants down by the Odeon. I find it quite handy to pop down here for a quick shop rather than having to head into Oxford Street or BlueWater. To be honest, I’d rather retail outlets stayed in high streets – there’s nothing grimmer than a car park with some soulless barns attached. But that’s my personal opinion. To add something to Matt’s piece above – the Victoria Way mound was earmarked for use as part of the now-cancelled Greenwich Waterfront Transit, when a route was considered via the retail parks. With the econmony as it is I wouldn’t take outline planning permission as any kind of certainty that the proposals will actually be built. Its possible to get outline permission with relatively little investment in design, and the permission can add value to the land. Does anyone else think it curious that neither the Council (if its public land) nor the managers of the retail park can be bothered to sweep litter from the alleyway from Woolwich Road to the retail park ? My girlfriend has been on an ongoing offensive with regards to the litter in the alleyway. Three years ago she managed to convince the council to put a bin at the end of the alleyway on Woolwich Road. It didn’t work, and was thus taken away. She’s recently contacted Cllr Mary Mills and then Clean Sweep about it’s current state. Clean sweep apparently do a daily clean up of Woolwich Road (Monday-Friday), which seems a little surprising as it’s not the most cleanest of roads. However, Clean Sweep seem to suggest that Asda should be doing more with the alleyway. My girlfriend is in the process of contacting CleanSweep and Asda again to get an update and possibly shake them into some action. Seems funny how the areas in Britain with the most rubbish seem to be those that are blurred between two boundaries and seem to escape two parties’ responsibilities.